Cyclone thane wrecked coastal areas of Tamil Nadu and neighbouring union territory of Puducherry this morning. Flights have been disrupted, trains are either called-off or delayed by multiple hours. Electricity is absent and Puducherry is currently facing heavy showers with winds zooming above 130-140kmph. Showers are expected to last for about 4-5 hours (till 1pm, 30th Dec). 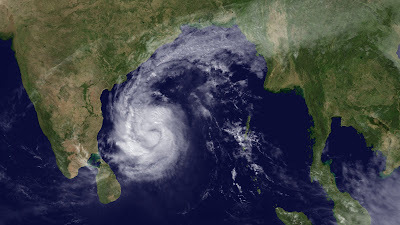 More information on Cyclone Thane can be found on Tamil Nadu Whetherman website. People can contact the helplines in case of emergency. Tiruvallur district administration – 27661200, police control room 27661010. Trains running on Chennai Central-Gudur and Chennai Egmore-Villupuram-Cuddalore-Mayiladuthurai routes in both directions are likely to be regulated en route or diverted on Friday, according to a Southern Railway press release. Met-department asked people to stay in houses, as a safety measure. Information taken from India.cd on Facebook.